It’s reported that approximately ten percent of dogs develop some kind of environmental allergy. Vets have reported that the number of these cases grows each year! Here are the symptoms to keep an eye out for and which breeds are more susceptible to allergies. Routinely bathing your pet with hypoallergenic shampoo will help remove allergens and also moisturize skin! Experts recommend a bath for your pet every 2-3 weeks to wash away dirt and bacteria. We know this might sound odd, but soaking their feet at the end of the day can drastically decrease what they track in and around sleeping areas. This includes allergies, chemicals, or other irritants. At the very least, wipe their paws after walks or being outside for a long time. 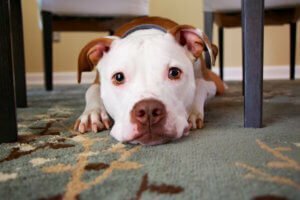 Get your carpet and upholstery professionally cleaned in order to eliminate dirt and allergens that are hiding in your home. Maintain cleaned surfaces by vacuuming weekly with a vacuum equipped with a HEPA filter. Common allergens such as ragweed can find their way into your home fairly easily. This happens as plants continue to die due to colder weather. You can reduce the number of ways allergens can enter your home by keeping your windows and doors shut. There are great supplements that will decrease itching and improve the health of your dog’s coat. Do some research on your dog breed to find the right one for your pet. Biotin and omega-3 are both popular supplements for pets. Your pets can be tested and treated for allergies just like you can. With pets, there are a couple main methods for treatment. Injection: This all depends on how severe your pet’s allergies are. Typically, owners may need to inject their pets with a shot every couple days and slowly decrease the amount over time. Sublingual Immunotherapy under the Tongue (SLIT): This is a medication given straight to the inside of your pet’s mouth. Useful for pet’s who don’t like shots. Always consult your veterinarian before changing your pet’s diet or introducing new medical treatments!